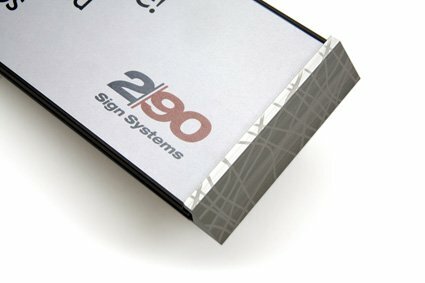 Welcome to 2/90 Sign Systems!About Us | Welcome to 2/90 Sign Systems! 2/90 Sign Systems is the evolution of the original wayfinding system first created by Charlie Tyke in 1978. We are the pioneers in the wayfinding industry, with an extensive line of long-lasting, modular products that are designed and manufactured in the United States to the highest quality. We offer turnkey, regulation compliant wayfinding solutions from concept and design to installation, maintenance and repair. Wherever wayfinding products are needed, 2/90 Sign Systems is ready to help design professionals, facility owners and more with our unparalleled products, knowledge and service. Whether you’re updating an outdated wayfinding system to meet current regulations, or you’re implementing a system in a new, refurbished, or expanding facility, 2/90 Sign Systems is helping people find their way. 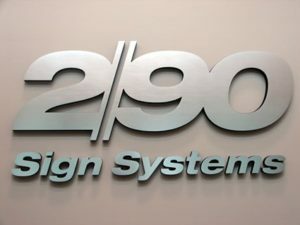 2/90 Sign Systems is an employee-owned company with over 90 owners dedicated to producing quality signage products, systems, consultation and more for our customers. 2/90 Sign Systems is an industry leading architectural signage company developing comprehensive interior and exterior wayfinding systems for commercial and government clients. With more than 40 years of experience in planning, fabricating, installing and maintaining signage systems, 2/90 has a proven history of successfully managing comprehensive signage projects for clients across the country. 2/90 Sign Systems is always on the lookout for sales professionals with signage or contract furniture experience. If you are an independent manufacturer’s representative in need of a quality product line to complement your current offerings, or want to represent our products exclusively, we want to hear from you. If you are interested, please email your resume to info@290signs.com. Apply today and become part of the 2/90 Family! Although signs do not hold a specific place within the widely recognized LEED rating system, incorporating modular signs in a facility is a key factor in sustainable design. The US Green Building Council agrees. It selected 2/90 Sign Systems Slide window inserts with paper, for workstations at its headquarters in Washington, D.C.
Not only do we strive to provide a sustainable product, we also manufacture it with a minimal carbon footprint. 2/90 Sign Systems is committed to researching ways to incorporate recycled and low environmental impact materials into our products with the belief that environmental responsibility and stewardship benefits all of us.